The zoetrope was replaced by the Praxinscope. 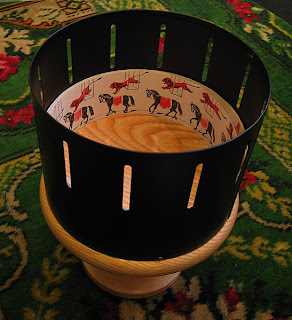 You've seen a zoetrope in the museums. You know you spin the wheel and look through the slots. "The praxinoscope improved on the zoetrope by replacing its narrow viewing slits with an inner circle of mirrors, placed so that the reflections of the pictures appeared more or less stationary in position as the wheel turned. Someone looking in the mirrors would therefore see a rapid succession of images producing the illusion of motion, with a brighter and less distorted picture than the zoetrope offered." In the video below, the filmmakers took that method and applied it. No camera tricks at all. Pretty darn neato if you ask me.